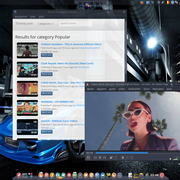 what is it mmm everything in it on it , develeopment everywhere , in background desktop , themes , icons , cairo , compiz , popcorn , development in backgrounds in browsers like firefox chrome ect...(all blocks wil be working direct , compiz spere or whatever working out of the box. steam , playonlinux , wine , everything that you can think of wil work direct in the live demo . nero burning rom , vmware , and alot more good appz and that distro wil be up to date on every software . first image (cairo wil run in the live user box , ) a bunche of themes and icons allready in there..
@juergen, this should also be in Community Submissions. But thanks for your work in putting together this respin.